To register, complete the following form. 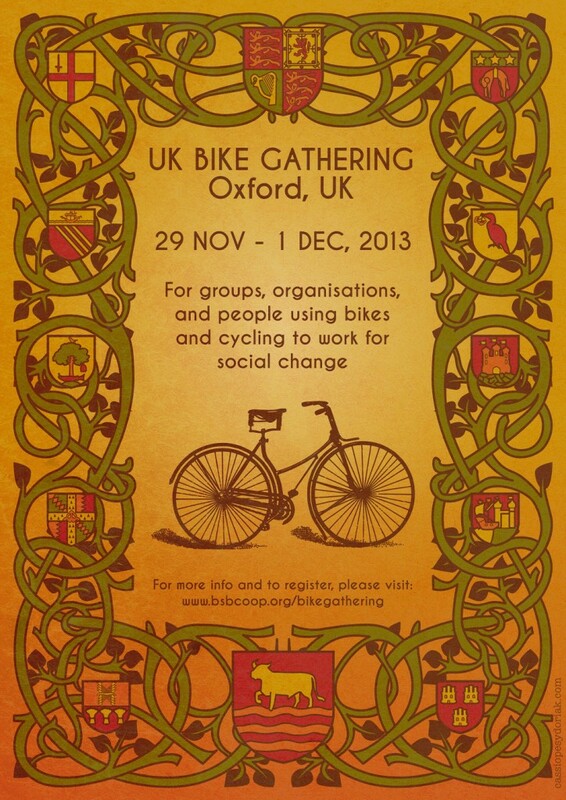 The official Gathering will start on Friday night with a Critical Mass, but workshops start at 10am on Saturday. Please send an email to ukbikegathering@bsbcoop.org if you wish to host a workshop, and we will attempt to place you with other similar themes. We hope that everyone who attends is there to share as well as to learn, so please consider hosting a workshop by yourself or with a team. This makes it more interesting for everyone. Dinner for participants and hosts will be provided on Friday night following the Critical Mass. Breakfast on Saturday and Sunday will be provided (fruit, museli, bread, tea, coffee, milk, juice), as well as lunches on Saturday and Sunday. Dinner on Saturday will also be provided for participants. All food is vegan/vegetarian and we will endeavour to source donations from local farms and oraganisations wherever possible. No one will be turned away from the Gathering due to lack of funds, but in order to cover costs of food we are asking for £20 from each participant. This includes 6 meals (dinner on Friday and Saturday, breakfast and lunch on Saturday and Sunday). If this is a problem, please speak to an organiser and we will figure out an alternative. We will be able to find a place for you to stay! Please email us at ukbikegathering@bsbcoop.org with relevant details. N.B. Due to space considerations, we will be able to find hosting for 40-50 people and will have to restrict numbers attending the workshop. We hope that 2 people from every interested organisation will be able to attend, and we will keep you posted about the number of people attending the workshop. Critical Mass, open to the public, leaving 18.30 from outside Tourist Information, Broad Street, Oxford. If you require a bike please let us know in advance and we will be able to find you a loaner. Following dinner on Saturday night, the general public will be invited to attend an evening of movies, discussion, chatting, and drinks. It will be a fantastic opportunity for various organisations in Oxford to meet people from other cities and discuss community issues of importance to them. There will be a travel pool to spread the cost of people traveling from far away. Please let us know if you are interested in joining.